PERHAPS a brief summary of the argument which forms the basis of this analysis of distribution may be worth while before we turn from the question of "what" distribution is to the question of "why" it costs so much. The distribution process, that infinitely complicated process by which finished goods move step by step from the producer of the raw materials through brokers, fabricators, wholesalers, and retailers to the ultimate consumer--is really a series of marketing and merchandising and transporting and storing operations. Distribution begins with the producer. The producer of a raw material such as cotton, under our present economic system, must sell his cotton. He must devote time to the selling and storing and delivery in order to market his cotton, and the costs which he incurs in marketing, storage, and delivery are the first costs in the distribution of cotton. Every factor, in the same way, who handles the raw cotton, including the weaver and converter of the cotton fabric, has to market, ship, and store the cotton and the costs which he incurs in these marketing operations are all costs for performing various steps in its distribution. Finally, the costs of merchandising or marketing by wholesalers and retailers determine the cost of performing the last step in the work of distribution. A true and complete total cost of distribution is therefore the total cost of marketing by all the factors involved in distribution from the producer of the raw material to the consumer of the finished product. It is a common error to assume that the cost of distribution consists only of the cost of doing business by retailers and wholesalers. As a matter of fact, for a real understanding of the causes for the rise in the cost of distribution it is necessary to recognize the greater importance of marketing early in the process of distribution, because if there are excessive costs in the early stages of the process, they are pyramided continuously at every advancing stage, until finally, what may have been only a small excess cost in the beginning has become in the end a large part of the entire cost of the product. Of the total energy of the nation, less is now devoted to the production of goods than was the case fifty years ago, but much more to their marketing. Each farmer today, thanks to the modern tillage and harvesting machinery, to tractors and automobiles, produces more than a dozen farmers produced fifty years ago. In spite of the fact that the population which we feed increases year by year, the number of farmers needed to produce what we eat decreases year by year. The cost of producing our basic utilities has not, therefore, increased relative to all other costs. But neither has the cost of producing form utilities, or place utilities, or time utilities. Modern factories employ less labor per unit of production; modern railways employ fewer workers per ton mile of freight transported than was the case when mass production was in its infancy and goods, if shipped at all, were transported in Conestoga wagons. If human energy is used as an index of costs, then costs of production are less today. More people are engaged in distributing raw materials than were engaged fifty years ago--fewer in producing them. More people are engaged in distributing the finished products produced by our factories--fewer in producing them. And more people of course, are engaged in retailing and wholesaling than fifty years ago. If human energy is used again as an index of costs, then the cost of distribution is higher today. Production costs less today than fifty years ago--distribution costs more. Let us now see why this change has taken place, and why this change continues at a constantly increasing rate. In 1870, the primary power used exclusively in manufacturing was 2,346,142 horsepower. By 1920, it had risen to 29,504,792 horsepower. In fifty years it increased more than one thousand per cent, in total horsepower. At the same time the quantity of goods which could be produced for each horsepower used in driving machinery was increased almost beyond measure. The capital invested in manufactures in 1870 was $1,694,567,015. By 1920 this had increased to $44,466,593,771. No allowance has been made in these figures for the decrease in the purchasing power of the dollar. For one reason, because the dollar invested in 1920 bought proportionately more productive machinery and erected proportionately more efficient factories. The purchasing power of 1870 dollars may have been twice as great as the purchasing power of 1920 dollars, but the factories erected with 1920 dollars are capable of producing much more than twice as much as factories which the 1870 dollars erected. 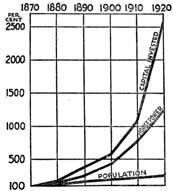 During this same fifty years, the population increased only from 38,588,371 to 105,710,620. Using the year 1870 as a base, the population has grown 174 per cent., horsepower has grown 1158 per cent., and capital invested has grown 2524 per cent. This is shown graphically by census years in Table III. In other words, each consumer today has to consume the products of .2791 horsepower, as compared with .0608 in 1870, or four and one-half times as much as the consumer of fifty years ago. Actually, he has to consume much more than four and one-half times as much, because of the enormously greater output of each horsepower used in production today. But he must not only buy more than four and one-half times as much in goods. He must pay proportionately a higher price for interest and dividends on the capital being used by the manufacturers. Horsepower increased four and one-half times, but capital invested increased in the same period over twenty-six times. The prices paid by consumers today must therefore include interest and dividends upon over twenty-six times the capital used by manufacturers fifty years ago. There is no good reason for believing that the next fifty years will see any great change in the growing disproportion between increasing facilities for manufacture and increase in population. On the contrary, a lower birth rate and the restriction of immigration are reducing the rate of increase in population. If manufacturing facilities increase in the future at the same rate as during the past fifty years, the disproportion should become greater and greater year by year. Assuming that the rate of increase will be the same in the next fifty years as in the ten years between 1910 and 1920, we should have by the year 1970 the amazing situation of a population increase of only 799 per cent., of a horsepower increase of 8,038 per cent., and of a capital invested increase of the fantastic amount of 25,779 per cent. This speculation as to what may happen in the next half century may be discounted as much as any one desires, and yet one will be driven to the conclusion that the strenuous present day competition for markets is mere child's play compared to the struggle in which the next generation will be engaged. A full grasp of the significance of the nation's growth in capacity for production explains the intense competition for markets among manufacturers today. All this production machinery must be kept producing at least to such a percentage of its possible capacity as will yield an adequate return upon the investment in it. The only reason it is not all operated to full capacity is because the quantities of goods which would then be thrown upon the market would result in price declines to catastrophic levels. Unfortunately, instead of lessening the intensity of the competition, operation of all this machinery at part of capacity actually intensifies it. The effort to sell is naturally intensified in proportion to the idleness of factories. The manufacturer producing to 90 per cent. of his plant capacity is spurred on to sell the additional 10 per cent. capacity of his plant only by the desire for additional profits. Selling 90 per cent. of his capacity will yield him a satisfactory profit. Selling an additional 10 per cent. simply increases the amount of his profits. But a manufacturer who is selling to only 50 per cent. of his plant capacity may be driven to secure even so little as an additional 5 per cent. of business by the dire necessity of getting it or of going bankrupt. Selling only half the capacity of his plant means that he is losing money. If 5 per cent. more business will enable him to break even, he will get that 5 per cent. even though he has to cut the heart out of his normal margins in order to get it. It is difficult to estimate how large a part of the nation's production facilities are normally in use. One particularly able observer of economic tendencies, Colonel Leonard P. Ayres, uses the number of blast furnaces in operation as a barometer of business conditions. When blast furnaces are in 60 per cent. operation, conditions are normal. When this figure is exceeded, productive industry is experiencing a period of good times; and when it falls below that figure, it is in for a period of hard times. It is obvious, if 60 per cent. represents normality, that consumers of such a basic commodity as pig iron must pay dividends upon an investment capable of producing two-thirds more pig iron than the country uses in normal times. It needs no great exercise of the imagination to appreciate how pressing the urge to sell must be, how intense the competition when manufacturers are confronted with the problem of earning dividends under such conditions. The estimated capacity of the country's flour mills as a whole is approximately two and one-half times the largest production, according to Edmund Brown, Jr., ("Marketing," p. 52.) who made a study of the grain trade for the Federal Trade Commission Apparently there are ten milling companies which could under pressure produce half the flour made in the United States in an ordinary year. Our steel plants are now equipped to produce 70 per cent. more steel than the normal requirements of the market. Our shoe factories have an excess capacity of 80 per cent. Our copper smelters an excess capacity of over 100 per cent. While our lumber mills have an excess capacity of over 300 per cent. Even the automobile industry,--one of our youngest big industries--has a capacity 80 per cent. greater than the ability of the market to absorb automobiles. While in the textile industry,--one of the oldest industries--we find rayon manufacturers increasing the capacity to produce fabrics from this new fiber by leaps and bounds,--at the very time when cotton mills, woolen mills, and silk mills, have each of them enormously greater capacities for producing fabrics than it is possible for the market to absorb. But over-capacity for production is not confined to machinery operation in what is each industry's normal working day. Many industries are organized to operate night shifts which very nearly double the existing over-capacity for production with the same equipment, the same machinery, and the same buildings, while those which are organized on a twenty-four hour basis can very nearly triple a volume of business which is already in excess of the ability of the market to absorb their products. Is it any wonder that the manufacturers today are more concerned about the problem of marketing than about the problem of producing? No matter how amply supplied the markets may be, they must be made to absorb more and more of the products of our factories. No matter how much the consumer who can afford to buy may resist, he must be made to eat more, to wear out more clothes, to take more drugs, to blow out more tires. He must consume, consume, consume, so that our industries may produce, produce, produce.
" --central target for a veritable barrage of psychic fire. From all sides, it seems, our emotions are being peppered, our intellects sprayed, our desires shot up by a stream of quick-fire appeals that in our lucid moments appear ominous if not disastrous to any sort of meaningful, reasoned existence. In our ears is the roar of brands, before our eyes a mad dance of trade-marks. Assured by this bill-board that Jimson makes pluperfect pickles, we are lapelled by that newspaper to the effect that no pickles in the universe are the equal of Timson's. Here is the ultimate in motor-car manufacture, says this magazine, only to come to another ultimate a few pages further on. It is all very confusing and getting more so every day." How are our industries meeting their imperious need of making more sales, of extending their market, or distributing a large enough part of what they produce to operate profitably? The good old times, when factories were unable to produce goods fast enough for a population used to handicraft production, are gone. It took over a century to invent the necessary machines, develop efficient methods of spinning and weaving, and secure the capital for the production and erection of our cotton mills. It took the cotton industry all that time to multiply its machinery for production to the point where spinning and weaving and finishing facilities were in excess of the needs of the market. During most of that century, the cotton manufacturers had a comparatively simple marketing problem. Their real problem was not marketing, but production--production at low enough costs, production in sufficient quantity. Contrast the time it took this old industry to develop a surplus of manufacturing facilities with a new industry,--the radio industry--which has had its gestation, birth, growth, and maturity in recent years. In less than a year after tubes, receivers, and loud speakers were standardized and put in mass production, capital had flowed into the industry in such quantities,--facilities for production grew to such magnitude--that the surplus production of manufacturer after manufacturer had to be thrown upon a demoralized market. Not only does our technical advance make it easier today to overproduce, but the greater mobility of capital and the vastly greater quantity of capital seeking investment make doubly certain that facilities for production will always be in excess of actual demand for goods. Old industries and new industries are both thus confronted by the imperious need of selling more goods. The potential supply of products is always greater than the immediate demand of the market. Sales in profitable volume must be secured. If consumer resistance exists--it must be broken down with national advertising. If existing channels of distribution can not be made to take additional volume, new channels must be blasted in which to move the manufacturer's products. If existing markets refuse to absorb all of the production, new markets must be created. If the natural market of a manufacturer--the local territory which is near his factory and which it is most economical for him to supply--does not yield sufficient sales, then the entire nation must be invaded. An intense competitive warfare is then waged, not only with manufacturers situated in the "foreign" territories, but with all the manufacturers who are after the national market. And, if the national market does not yield sufficient sales in the way of business, then the international market must be invaded. Foreign trade, like domestic trade, when it consists of an exchange of the products which one country can produce more economically than another, is of course a gain to both. From the standpoint of good international relations, however, it is not a desirable thing that nations should be industrialized to such an extent that the quest for foreign markets precipitates those international rivalries in which wars readily breed. Yet we might as well face the fact that we are already industrialized to just that extent. Up to the beginning of the period which we have to face now, our population--thanks to immigration--increased with amazing rapidity. The demand of the domestic market was therefore sufficient to absorb a large enough part of our total production to enable our factories to operate profitably. In addition, our wealth in natural resources enabled us to pay the masses (who constitute the bulk of our consumers), such exceptional wages for labor that they have been able to increase their consumption year by year and thus utilize some of our increasing capacity for production. Our population, however, in the next fifty years will not increase so rapidly. Nor will our superabundant natural resources last forever--though we shall not probably feel the effects of their disappearance very soon. With a comparatively static population, we shall sooner or later be driven to enormous increases in exports if our factories are to be kept busy. Yet our whole economic organization is at present devised to prevent exports. Our tariff, our merchant marine, are all mercantilist in their conception and development. We may extend the period of this temporary relief by accepting securities in payment for our exports and in effect exporting capital. But we cannot export goods indefinitely without importing goods in payment. If we refuse to accept goods in payment, as in effect we are doing at present with a protective tariff, and ask our foreign customers to give us securities in payment--sooner or later the payments of the interest on the securities will have grown to such volume that the acceptance of the interest would find us importing goods in greater quantity than we would be exporting goods. There is no escape from this dilemma..
We might try to maintain the exports of our factories by a policy of undermining the industrial production of the nations to whom we export; of keeping them in economic vassalage. We might try "dumping" as a means of preventing the development of competing industries in those nations. Dumping, however, is a sort of international dynamite. When more than one nation begins to play with it, its repercussions interfere with dividends from the foreign markets. What I have inelegantly referred to above as "dumping," is the exporting of surplus production in order to break into foreign markets which are already adequately supplied by their own industrial organization. In dumping, the foreign factories cut prices below the point at which the local factories can maintain themselves. After the local factories have been destroyed or absorbed, the foreign factories have the local market to themselves. Dumping, however, is not confined to international trade. Domestic dumping is far more prevalent. It does not always take the form of price cutting, however. Generally, the domestic "dumper" operates with elaborate branch offices, high pressure salesmen, and national advertising. He raises prices, instead of cutting them, and justifies the higher prices by giving "service" of some kind. International dumping, if it arouses national or racial antagonism, results in war. Domestic dumping results, less dramatically, in higher distribution costs. If domestic dumping resulted merely in raising the marketing costs of the factories which turn to high pressure marketing as a means of securing sufficient volume to operate profitably, it would not result in a general rise in the cost of distribution. It is the effect of this high pressure marketing upon our whole distributing machinery which is important. Whenever a factory turns to high pressure marketing, the regular channels in which the products it makes are distributed are subjected to assault and battery. Existing channels are duplicated. Entirely new kinds of channels, many of them more costly than the old, are brought into existence. The old channels then cease to operate in their accustomed manner. The total volume of business is divided between new and old channels. Costs of distribution are raised not merely on the new product, but also on all old products which are handled. The creation of each new channel of marketing, which some individual manufacturer amply justifies because it produces profits for his factory, thus results in raising the cost of distributing a whole class of products.